Story by Rebecca Kalinowski and Pam VanderPloeg. Current photos by Pam VanderPloeg. EARLY photos AND DRONE PHOTO provided by the Sebastian family. "Brothers fondly remember the sound of bare feet running over pegged wood floors"
One of the striking features is the massive angled brick fireplace wall with staggered vents and a built-in rotisserie grill. Porch dining room for entertaining large groups of relatives, friends and business associates. On the lakeshore south of Grand Haven is a wooded two-track road with a hand painted sign, "Palomita." 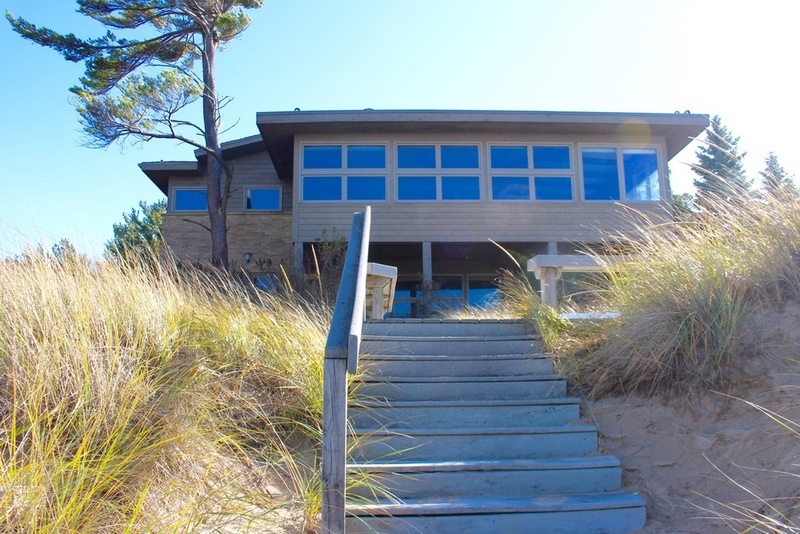 You take a sharp left over a little bridge to catch the first glimpse of the house with the three-season porch cantilevered out over the dune, directing your attention west to the big lake beyond. 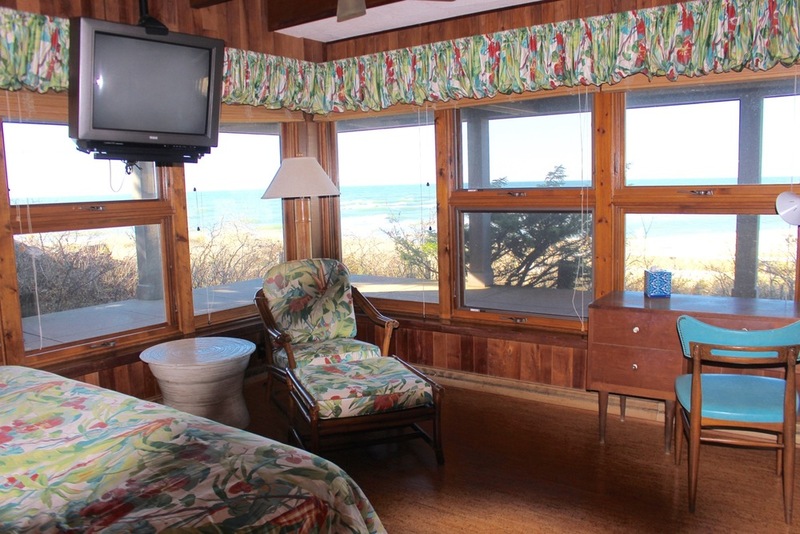 Palomita is the name of the Sebastian cottage — a family gathering place and a playground in the dunes since 1959 for James and Audrey Sebastian and their four sons Jim, John, Dave and Mike, daughter Anne and a host of grandchildren and great grandchildren. James and Audrey Sebastian bought the 60 acre property south of M-45 after the formerly titled Consumers Power Company bought the first Sebastian cottage at Port Sheldon. 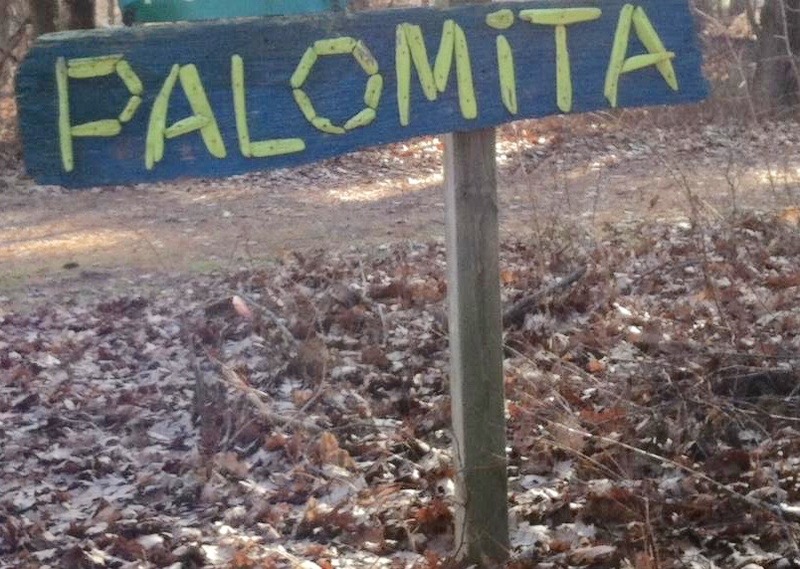 The new cottage and surrounding site was named Palomita, a name suggested by a business partner. The name literally means "little dove" in Spanish. It was named for the flocks of carrier pigeons that used to frequent the spot. It is an extraordinary property with 825 feet of low bluff beach on Lake Michigan with an abundance of wildlife including bald eagle. The family cottage was finished in 1958. It was designed with a facade of classic brick veneer and cypress. The roof was finished with asbestos shingles and had copper flashing. Brick ledges were called for in the plan. The mid-century structure is approached via steps leading from the driveway and attached garage to a newer composite deck ending in the handcrafted front door of white pine which was modern in style with three center placed glass lights shown in the original drawings. James Sebastian founded the Rapids-Standard Corporation in 1939 in Grand Rapids, Michigan, later called Rapistan. The company became a world leader in automation technology for manufacturing and distribution systems. Still located in the original company headquarters on Plymouth and Michigan NE, Rapistan changed hands several times and is now part of the North American Division of Diematics Group, a Luxembourg based company according to a February 20, 2014 article on M-Live written by Shandra Martinez. When Audrey and James decided to build the new cottage on Lake Michigan, James had a vision of what he wanted and worked side-by-side with Grand Rapids architect Wilfred McLaughlin http://modernwm.org/architects/#wilifred-mclaughlin, even transporting him to the site, since he didn't have a driver's license. When the stakes denoting the cottage’s orientation and footprint were placed in the sand, Sebastian took charge. He moved them all to turn the house so it would face the lake, not the creek as earlier planned. Son John Sebastian remembered specifically that the builder was Gordon Scholten of Borculo and when the house was finished Gordon declared proudly that it was the biggest home he'd ever built! Indeed upon entering the house a vast well-lit space with panoramic views of sand, water and sky is revealed. The brothers were not certain as they were pretty young when the cottage was built, but they believed that an interior decorator may have developed the interior plan. Living room seating with iconic mid-century furniture and a treasured family water color of the earlier Sebastian cottage at Port Sheldon purchased by Consumers Power in a 1950's expansion. Interior walls are paneled in horizontal boards burnished to a rich, golden brown patina. One brother thought the wood was cherry, the other remembered walnut. On one wall there are built-in bookshelves with a niche for the organ that James often played. Comfort abounds in this generous living room space outfitted with vintage Herman Miller and Danish furniture. Strategically placed lights and fans are hidden among the dark beams that support the ceiling. The Sebastian cottage has an open-concept floor plan. Note the built in shelving niche with the organ that James Sebastian often played. One of the striking features is the massive angled brick fireplace wall with staggered vents and a built-in rotisserie grill. Mike fondly remembers that everyone's favorite meal was his Dad's sugar steak cooked to perfection on the grill. Many cozy nights around a fire are indicated by smoke stains above the enormous fireplace with its sturdy black slate hearth. The blueprints called for windows with black slate sills matching the hearth. Next to the fireplace is a dumb waiter for moving firewood from ground floor to living room (who would expect anything less from the engineer who designed conveyer belt systems). Also on the brick fireplace wall are white stacked double ovens facing the kitchen. The stove has a copper hood. The kitchen is a huge space with Coppes-Napanee cabinets and floral tiles that are shown in the original blueprints. The kitchen floors were vinyl but are now cork, and the counters of the kitchen and bathrooms are still the original formica. Mike told us that an old school bell would ring the children in to dinner! He also fondly remembers the sound of bare feet running on the beautiful pegged oak floors. If you love the details of old building plans you will want to know that the living room ends in a wall of sliding glass doors described in the specifications as floor to ceiling triple track Arcadia units of thermopane polished glass in anodized aluminum frames. The sons have held on to the original blueprints, architect's notebook, kitchen drawings and even their father's handwritten instructions for maintaining and closing up the cottage. On the other side of those sliders is the 3-season wrap-around porch divided into two wings. One wing consists of conversation groupings. The porch was everyone's favorite place and they all have fond memories of watching storms race across the lake. Steps lead down from the living room to the hall where the boys bunk room is located and that often slept six or more at a time. Nearby was the girls bedroom, guest room and bath. 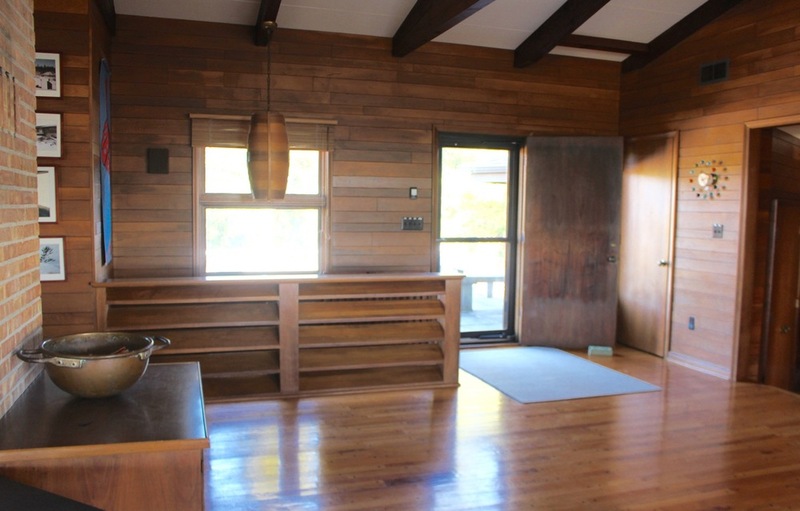 All have wood floors and wood paneled walls with built-in storage drawers and large pegboards. Boys bunk room where often 6 or more cousins would sleep. The bathrooms are roomy with lovely original tile, horizontal wood plank trim, built-in cupboards and windows bringing in natural light. The steep stairway features a unique Danish-style hanging light fixture and leads to the master bedroom with its wrap around windows and stunning lake views. The master bedroom is located at the farthest corner from the boys bunk room and is paneled in vertical boards with a cork floor and brick walls — a continuation of the living room fireplace wall. There is an access door to the shaded concrete patio under the porch and the sandy path down to the beach. 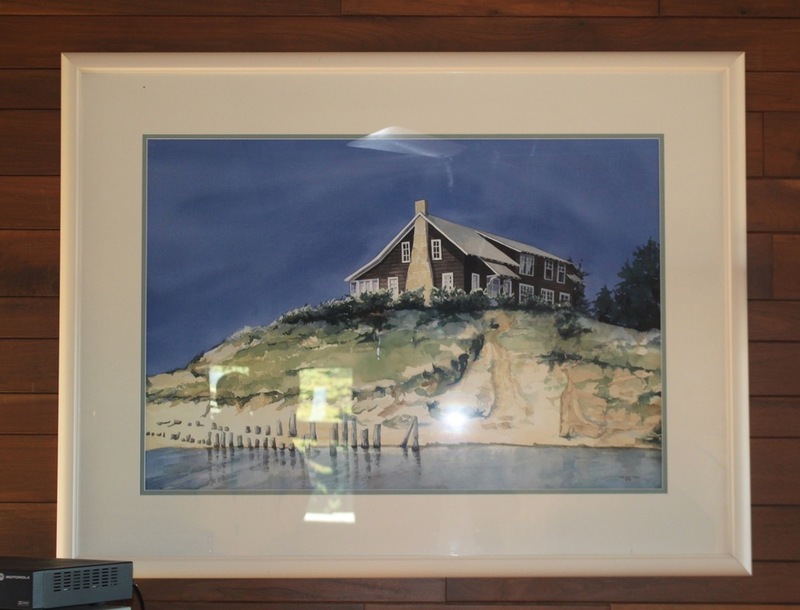 This is a lovely, large summer home designed at the time, in 1957, as a state of the art beach house. It is almost all original and filled with many personal touches that reflect the owner’s love of great design. Most importantly it resonates with warmth and comfort and shared family times. Mike shared one last anecdote on that beautiful fall afternoon we toured the house. 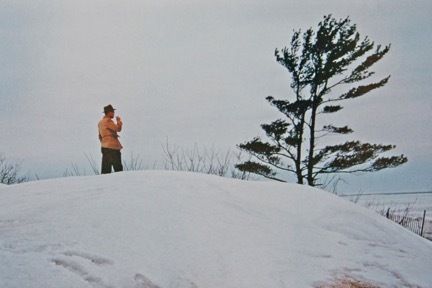 We stood under the tall pine tree adjacent to the patio that towers over the roof, and he shared that it was always referred to as "Dad's pine tree" or as Mike said, "Seeded by nature and saved by Dad." In 1995, the family gave 40 acres of land east of Lakeshore to the Land Conservancy of West Michigan creating the Palomita Nature Reserve. Palomita, the family cottage and remaining land is currently for sale. Although it will eventually pass to new owners, the gracious summer home will always evoke treasured memories for the Sebastian family.